A Hollandia 700 sunroof has one panel roof and will look like the following pictures. Make sure your vehicle is parked in a safe place. Make sure your vehicle is turned off. Apply the emergency and/or parking brake. Please sit in the passenger seat. Turn the ignition key to the "on" position but DO NOT start the engine. Now we will walk through the steps necessary to identify if your sunroof is part of the recall or not. First, locate the sunroof switch. 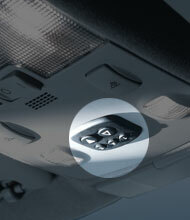 The switch is typically located in the overhead area near the front of the sunroof. 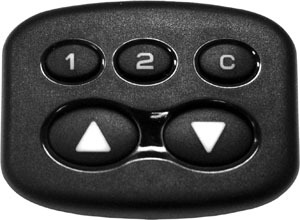 Some switches may be located on the dashboard or elsewhere. The switch for the Hollandia 700 will look like this. If your switch does not look like this then it is not a Hollandia 700 sunroof. If your switch matches this switch you will need to locate the sunshade next. The sunshade is located overhead and typically is closed when your sunroof is closed. The sunshade handle is located at the front of the sunshade and is usually black in color. The Hollandia 700 handle also displays the Webasto logo. Now with the glass fully open please stick your head up into the opening while looking forward in the vehicle and locate the serial number label. The label is black and white and should be located either in the center or the passenger's side of the vehicle. Next, look at the white part of the label for a bold large black number. This is your sunroof serial number. If your serial number falls between 6000000 and 6396298 your sunroof is covered under this recall. Please write down your serial number. It's required for the recall. If your serial number does not fall between these numbers your sunroof is not part of this recall. If you determined that your sunroof is the model included in the recall, or if you are still unsure, please call 1800 450 755 to find out how and when to get your sunroof serviced.